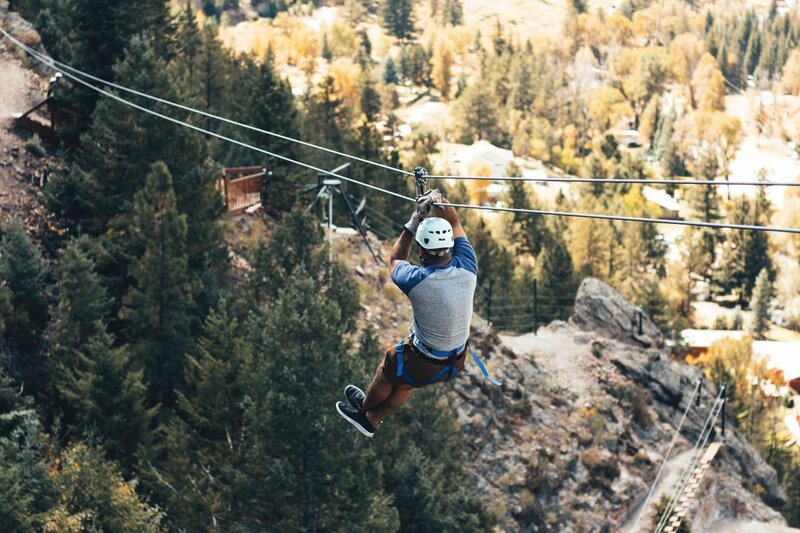 If you are looking for spring adventures in Colorado, look no further than AVA Colorado Zipline! Our Idaho Springs Outpost is located just 30 minutes from downtown Denver, 45 minutes from Summit County and an hour from Vail. Sure, you can head to the slopes of some of the Rocky Mountains’ best ski resorts, but why battle the lift lines when you can get cliffside with Colorado Zipline? Our Idaho Springs aerial tours were voted the Best Adventure Park of the Rockies for 2018. Join us this spring for one of our thrilling aerial adventures in Idaho Springs! Challenge yourself on our intense, cliffside Via Ferrata course! The Iron Way: Colorado Via Ferrata is a 3-hour mountaineering and traversing adventure tour. This thrilling aerial course is situated about 300 feet above the historic town of Idaho Springs, just 30 minutes from downtown Denver and 45 minutes from Summit County. The Iron Way tour will test you mentally and physically as you cross suspended bridges, jump off our 50 foot free fall, rappel down a 70 foot cliff and zipline back to our outpost! Watch our Via Ferrata Trip Video to see what you’re in for when you join us on the cliffside. Closed toe, secure shoes. No crocs, keens or sandals. What is a Via Ferrata? Read more here. Voted 2018’s Best Adventure Park of the Rockies by Elevation Outdoors! Save now on your spring zipline trip on our Cliffside Zipline course! Book your spring ziplining trip in Idaho Springs and take 20% off. Spring ziplining runs through May 6th, 2018. Challenge yourself on AVA’s mountaineering adventure! Book now and get $50 off per person on your spring Via Ferrata tour in Idaho Springs. Spring Via Ferrata tours run through May 6th, 2018. If you’re headed to the state for your spring break week or just looking for an afternoon getaway into the mountains, head to AVA’s Idaho Springs outpost – just 30 minutes west of Denver! You’ll get to skip the lift lines at ski resorts and enjoy an adventure packed day along the cliffside above the historic mountain town. Come join AVA this spring for a fun half day of exciting, adventurous, and extremely beautiful ziplining here in Colorado. You’ll love catching Rocky Mountain views on a whole new level, and we guarantee you’ll be smiling from ear to ear. Questions about your spring ziplining or via ferrata adventure? Check out some of the most frequently asked questions, or give our Trip Specialists a call at 855-ZIPPING (855-947-7464). We get it – you’re a visual person and you are itching for a visual idea of what exactly you are getting yourself into. We’re here for you, and so are our galleries. Check out the photos & videos from our Cliffside Zipline and Via Ferrata courses and prepare for a flood of excitement.